In Canada’s quintessential winter town and with that come the need for Sudbury snow removal and salting. Sudbury boasts continued precipitation year round, with no changes in daily levels even during seasonal changes. This continued precipitation means six months of snow cover per year! 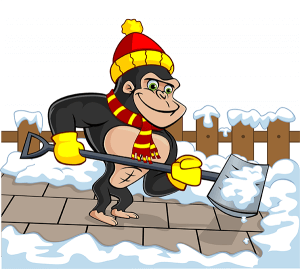 Trust our Gorilla professionals to take care of your winter maintenance. Our Gorillas understand that your property is unique and therefore will have different Sudbury snow removal and salting needs than your neighbours. Our technicians use only the tools most appropriate for your properties’ individual landscape. Motorized tools accommodate larger properties while shovels and Gorilla muscles get the job done during early and late hours. Discretion is our middle name, allowing you to rest easy while we do the heavy lifting. Salting is a necessary evil for driveways, walkways and any other walking surfaces around your property. These prevention methods maintain safety, not only for you but for guests as well as passersby. The majority of hospital visits during the winter months is a result or at least associated with ice or snow. Slips and falls are common place, a harsh reality for every Canadian but easily avoidable with the right precautions. Slips, however, are not the only misfortunes that winter can bring. Strains and sprains come easily when lifting bevy loads of snow. What do all of these things have in common? They can all be prevented when calling our Gorilla Technicians! We do the best job possible to ensure safe and happy customers, no matter the weather.